One of Jane’s Christmas presents was two tickets to see comedian Brian Regan on Saturday night, February 25 so Jane and I decided to make it a short weekend at our Dillon condo. In order to avoid the risk of traffic tie ups heading west on Friday night we ate dinner near our house at Buffalo Wild Wings before embarking on the trip to Dillon at around 7:30PM. We planned to return to Denver no later than 2PM on Saturday so elected to ski at Arapahoe Basin as it is only 20 minutes from our condo. 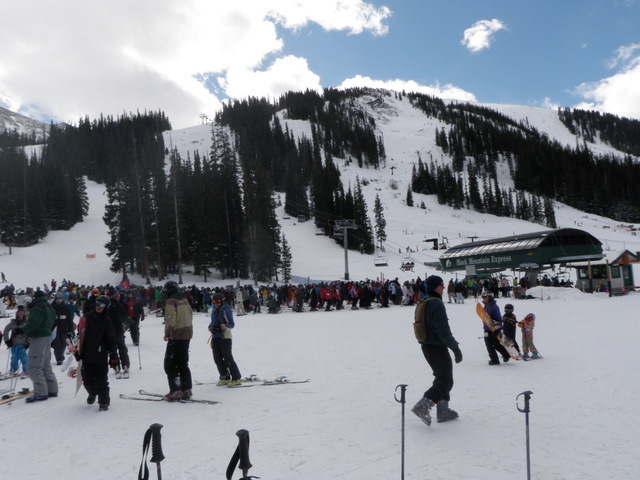 We began skiing at around 10AM and rode the Black Mountain Express and then the Lenawee lift to the top of the bowl. Here we discovered that Montezuma Bowl was open, so we slid down the far side. On the ride back up to the top of Montezuma the chair stopped frequently as high winds gusted by us. Fortunately our backs were to the wind or it would have been brutal. We did a few runs on the front side and took a break to warm ourselves up at 11:00AM. 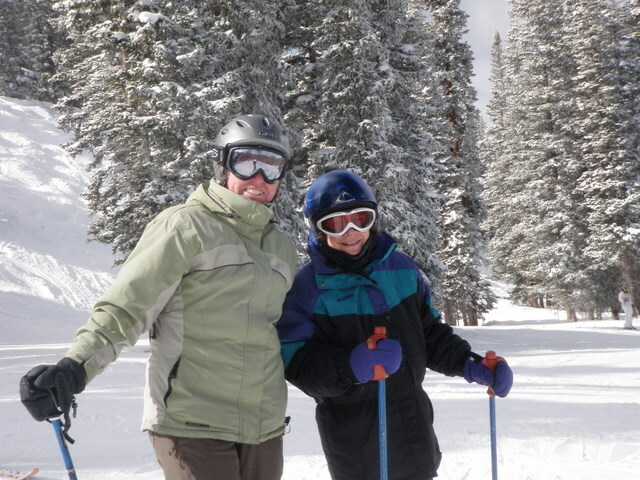 While we sat in the Black Mountain lodge and soaked up the sun in our little corner of heaven, Jane noticed that the Lenawee lift had stopped as well as the other lift that takes skiers to the top further to the right. Apparently the high winds halted lift service, and this drove all the skiers to the two lifts at the bottom. We skied from Black Mountain to the base and upon viewing the huge lines, decided to call it a day at noon and head back to Denver. 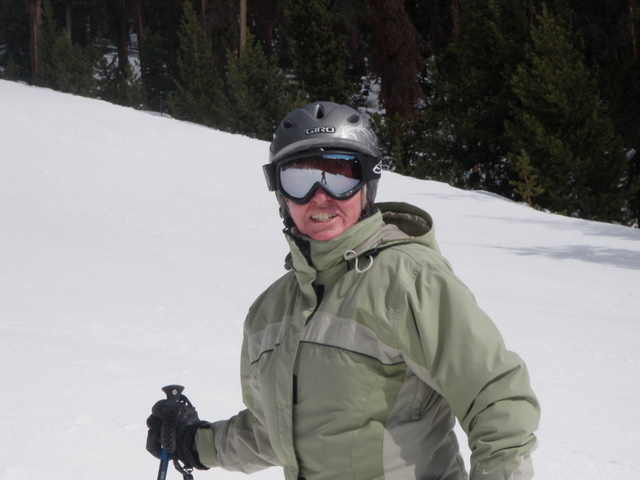 Jane and I decided not to rent our condo in Dillon for Presidents’ Weekend as our Colorado ski passes are blacked out for Vail and Beaver Creek, and this concentrates all the skiers at the remaining available areas on the pass. Since we didn’t have this commitment, Jane decided to use some air miles that were going to expire in six months to book a trip back to New Jersey to visit her parents and sister Jill and Jill’s family. 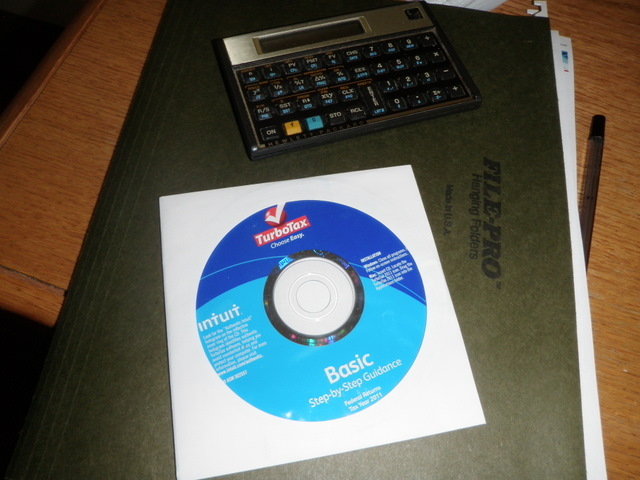 Meanwhile Dave looked forward to a restful weekend preparing federal and state income tax returns. Jane’s weekend pretty much worked out as planned, although she suffered through flight delays on Friday evening and didn’t arrive at her hotel until 3:15AM on Saturday morning. Fortunately she didn’t have any time commitments on Saturday and was able to sleep for perhaps four hours before preparing a tasty breakfast for her Mom and Dad. After breakfast she visited with sister Jill and then took her niece Jaelyn shopping for birthday gifts. 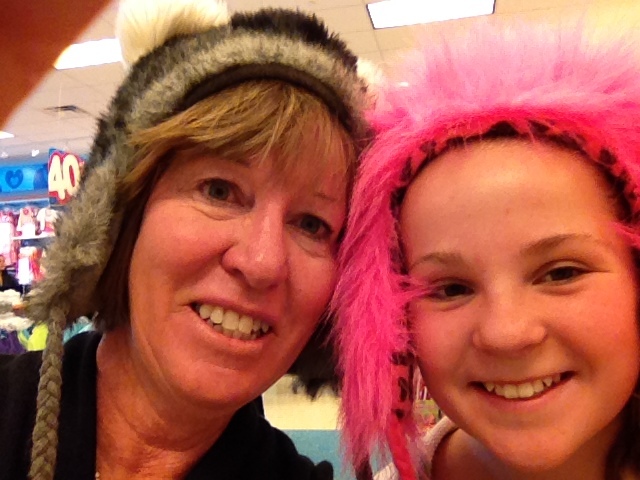 Apparently they visited quite a few stores and Jaelyn bought some nice Phillies sportswear. Saturday evening Jane, the McKays and her dad went out to dinner at Bahama Breeze and apparently a great time was had by all. On Sunday Jane watched some old home movies that were converted to VHS tapes with her parents and then took a nice walk along the Cooper River before returning to the McKays for a pizza dinner. Meanwhile Dave cared for Pip, our maverick cat and fit in his exercise routines around preparing federal and state income tax returns. 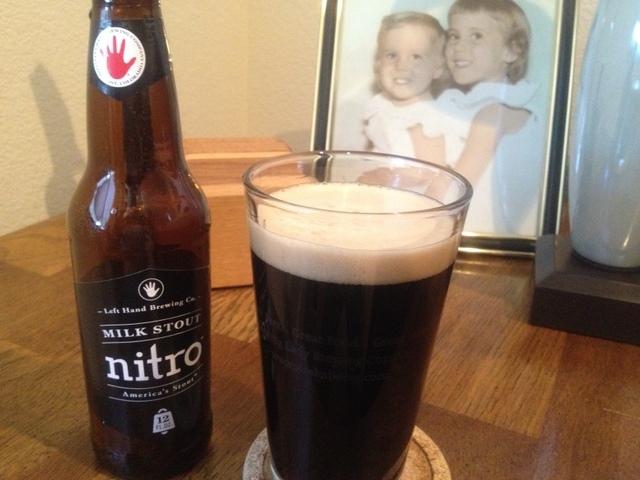 One of the highlights was opening a Valentine’s gift of Left Hand Milk Stout Nitro on Saturday followed by a delicious home cooked meal of fish sticks, lima beans and buttered egg noodles. This is a bit of a joke as Jane doesn’t like fish sticks or lima beans, so when she travels, Dave always uses that as an opportunity to make his favorites. 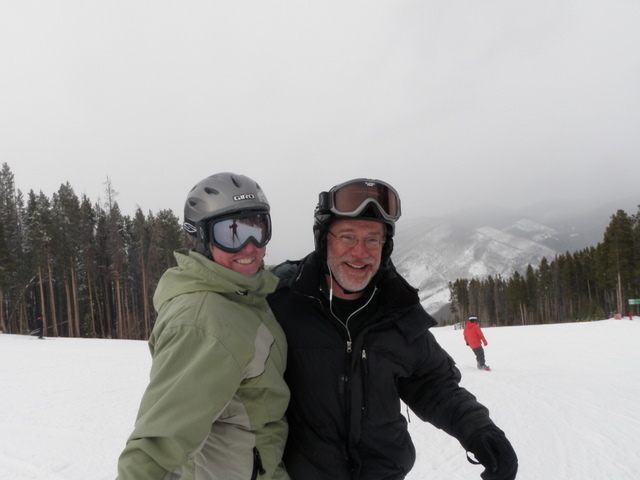 Jane was able to take a vacation day on Friday, February 10 so John Broadbent joined us on a weekday ski trip to Vail. Once we’d arrived, we met our friends Fred and Douggie Young at the top of the Mountaintop Express lift at 10AM. With Fred leading the charge, John and I immediately did four runs in the back bowls while Jane and Douggie dropped down the frontside and met us at the top of the lift. It was pretty amazing how close the timing worked out on our two separate groups arriving at the top of the lift within a tight time range. We all headed to Blue Sky Basin for a couple nice runs before lunch and and then were lucky to grab seating for five at noon in Two Elks Lodge. After lunch Fred, John and I did three more runs in the back bowls; China Bowl, Teacup Bowl and Sun Up Bowl before rejoining the girls at the Avanti lift at 2:30. We did two more runs on the front side of Vail before calling it a successful day. The snow was the best I’d experienced this season so far, but the air temperatures remained quite cold throughout the day. John, Jane and I returned to our condo in Dillon and relaxed a bit before meeting Fred and Douggie at Hacienda Real in Frisco for a filling dinner. After dinner we returned to the condo and attempted to keep each other awake. 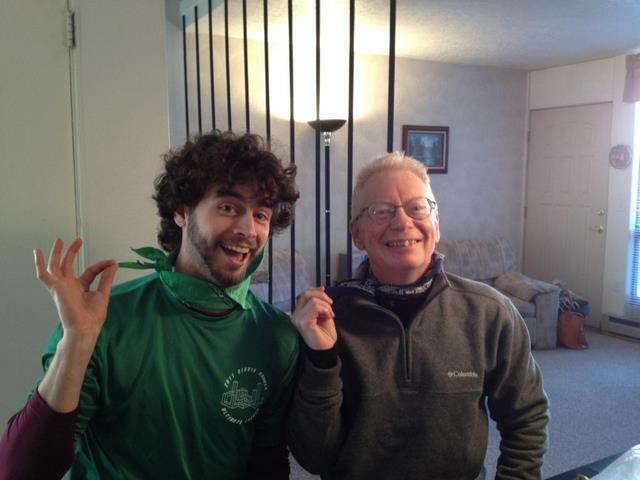 On Saturday morning we had a great breakfast at the condo, John departed for his return trip to Denver, and Jane and I prepared to cross country ski. 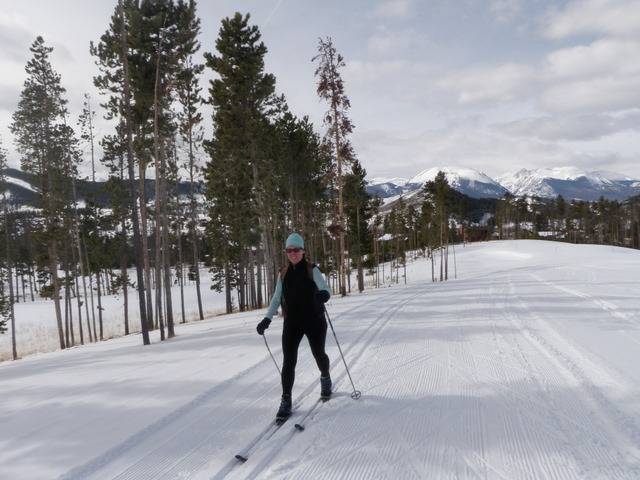 We visited the Wilderness Sports outdoor shop in Dillon, and Jane rented skis, poles and boots and then we set off for the Keystone Nordic Center. The nordic center was easy to find, and in short order we’d purchased trail passes and set off on one of the many loops that begin at the lodge. It turned out to be a gorgeous sunny day. I’m sure the temperatures never rose above the 30’s but with the radiant energy emanating from the bright sunshine, it felt like the 50’s. Jane and I accomplished three loops. The map guide told us that the last loop should take 55 minutes, so we set a goal to beat that mark, and did in fact finish the distance in 45 minutes including a stop to take photos. After skiing we checked out the town of Dillon and watched some crazy para-skiers propel themselves across the frozen surface using wind power. We returned Jane’s ski package and then drove across the dam road to Frisco so Jane could visit the bead shop on the main street. After browsing the beads, we stopped at a coffee shop for tea, cappacino, and a cranberry nut bar treat. Next it was back to the condo to take showers and await Dan who was skiing at A-Basin on Saturday with some friends who rented a spot on “the beach”. Dan arrived around 5PM and we chatted a bit before heading out to Murphy’s for dinner. Dan had run in to Brady and Kara at A-Basin, and they were staying at Fred and Douggie’s condo, so we invited them to join us at Murphy’s. They did in fact agree to join us and arrived in time to share in some Thai chicken appetizers. After dinner Dan returned to the condo and retrieved his bag before returning to Denver. Jane and I packed everything up on Sunday morning and got an early start on our return trip to Denver to prepare for another work week. How many different types of baetis nymphs does a fisherman need for his or her fly box? 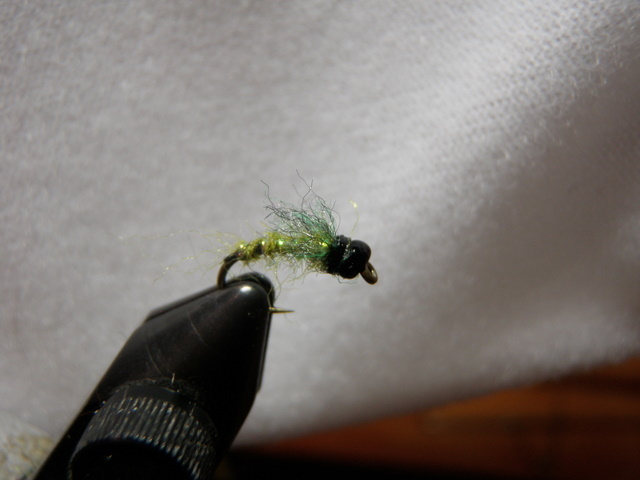 I made some teal baetis nymphs from Scott Sanchez’s book several years ago and pretty much exhausted my supply. As I flipped through the book again, I noticed it and decided to tie a few more. Scott’s pattern suggests using a clear glass bead or black metal bead. I had both available, but the glass beads tend to break after a lot of usage so I opted for the metal bead. I threaded five beads on to five hooks and gathered the materials and began to tie. 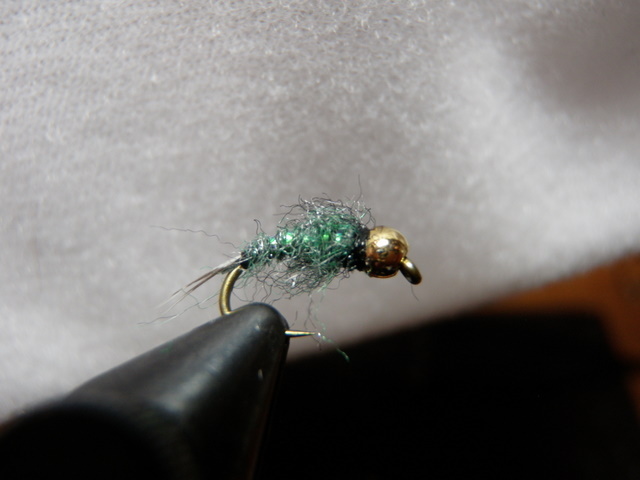 Originally I thought I might make more than five, but after tying several I changed my mind and halted my teal baetis nymph production at five. Tying with the teal fibers is very tedious due to the fragile nature of the twisted fibers. I tore off the fibers two or three times in my efforts to twist and wrap the abdomen. 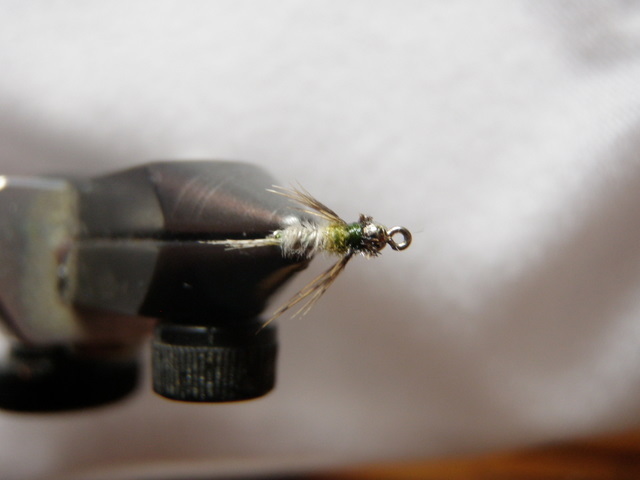 When I notice blue wing olives hatching, I tend to select a RS2 from my fly patch, but I do recall an occasion when the teal baetis nymph produced. I was on the South Platte River in Wildcat Canyon late in the afternoon and observed some olives emerging. 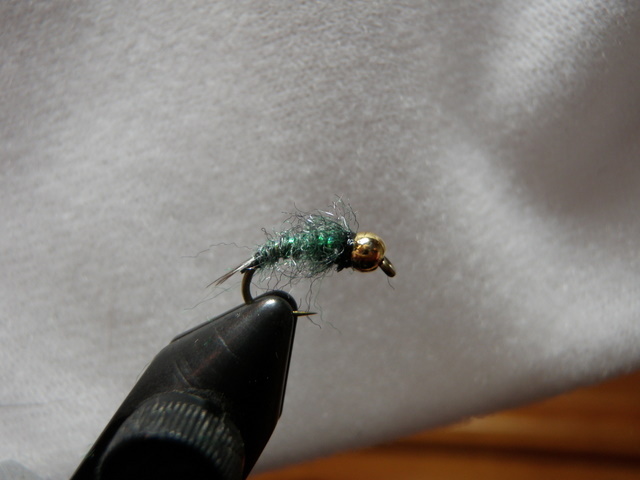 I was running low on RS2’s, and since I’d hiked three miles from my car, I didn’t have the option of returning to the car to supplement the flies on my patch so I selected a teal baetis nymph and fished it as the bottom fly below a beadhead hares ear and attractor top fly. 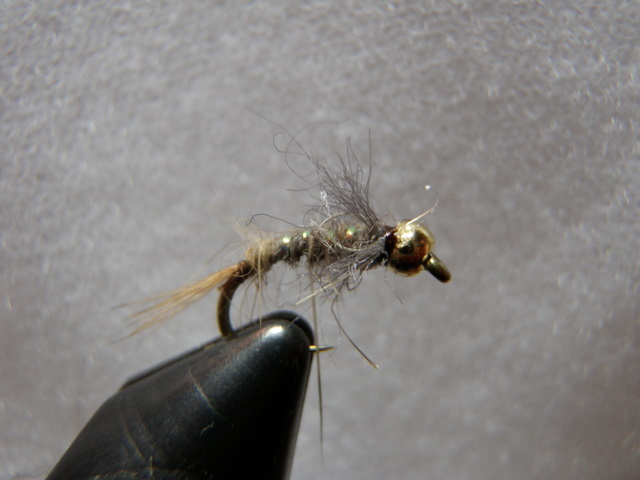 The teal baetis nymph produced well in this situation, thus, I’d like to have a few available. Jane and I watched the weather reports anxiously as the weekend approached. We spent a lot of money to rent our condo in Dillon for weekends during ski season, and the approaching storm could inhibit our ability to drive to the mountains on Friday, February 2. Was this storm going to deliver on its forecasted accumulation? As I completed my daily run on Thursday after work some fine snow began to descend from the overcast skies. The weather forecasters were right on the money as they predicted the storm would begin around 5PM on Thursday and continue until Saturday morning. When Jane and I awoke on Friday morning, there was already perhaps eight inches on the ground at our house, and the overcast sky indicated no end in sight. We each left for work and at noon Jane called to let me know that she was getting out of work early to hunker down and wait out the storm. 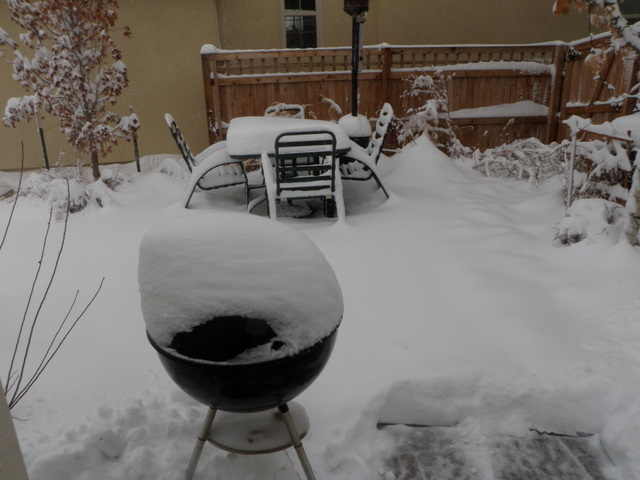 I kept checking the weather reports, and I noticed the accumulations were the greatest on the plains, significant in Denver but less than the plains, and diminishing as one traveled west into the mountains. If we could make it up the major climb just west of Denver, we could probably get to our condo. When I returned home from work, Jane and I discussed the conditions and decided to make the trip. I shoveled the sidewalk in front of the house, and we tossed our gear and suitcases in the Santa Fe and took off for Dillon at around 2:30PM. The worst part of the trip was from our house to Idaho Springs, and I maintained a speed of 45 MPH on the steep downhill stretches in the mountains. Fortunately the trip was uneventful and we arrived at our condo by 4PM. Kirk, a friend of Amy and Dan, was planning to join us later in the evening, so Jane and I checked out the Dam Brewery in Dillon for dinner. After we returned home Kirk arrived and we watched the Nuggets lose to the LA Lakers. Unfortunately in spite all the snow in Denver, there appeared to be no fresh snow in Dillon as we awoke on Saturday morning and prepared to ski. 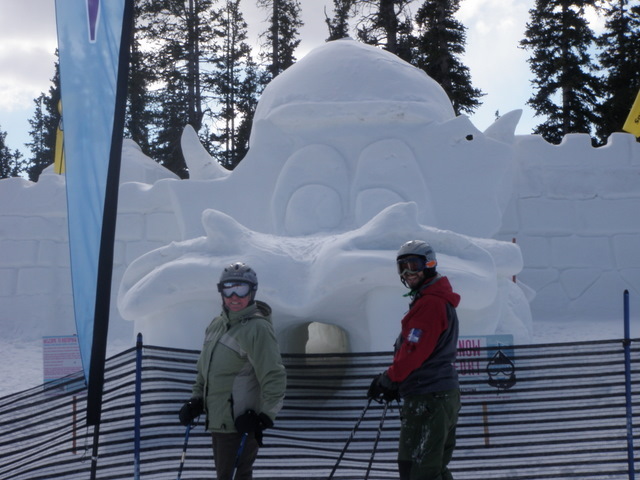 We agreed to visit the closest area to our lodging, Keystone Ski Area just up the road. We had a nice breakfast and left the condo by 9:30AM and arrived at the ski area ready to ski by 10AM. It was quite cold all day, but no snow. 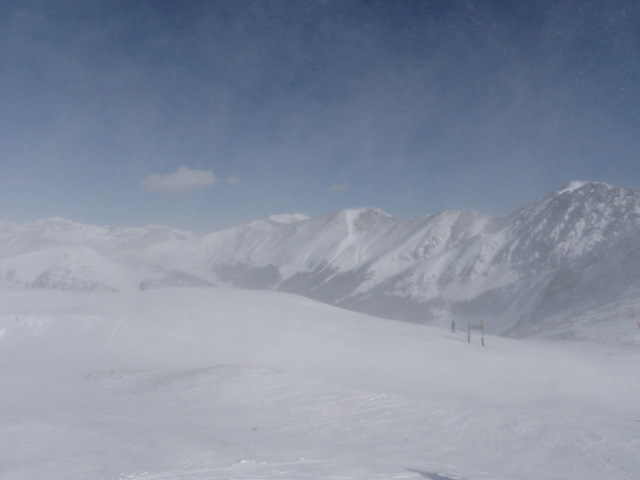 We skied mostly on the front side of Keystone, but did take two runs on North Peak after having a nice lunch at the Outpost. Lunch was perhaps the highlight of the day as the skiing was marginal at best. Most of the heavily used slopes were packed manmade snow with a thin layer of groomed granular dust in places. The best slopes on the frontside had icy scraped areas but enough softer granular snow along the border of the run to make turns somewhat in the realm of accomplishment. On the last run on North Peak after lunch, Jane fell and sprained her thumb, so she rested in Summit House while Kirk and I did two more runs. For the final run we skied down Flying Dutchman to River Run which was a sheet of ice. We returned to our condo and had some snacks while Kirk found a Starbucks with Wi-Fi to study before dinner. At 6PM or so we had dinner at Murphy’s Irish Pub, a nice little out of the way spot on Blue River Parkway north of I70. We returned home on Sunday morning to 15 inches of snow, but the roads were cleared and mostly dry. I did a cross country skiing loop in Central Park near our house before departing for a Super Bowl party at John and RoxAnne’s apartment. 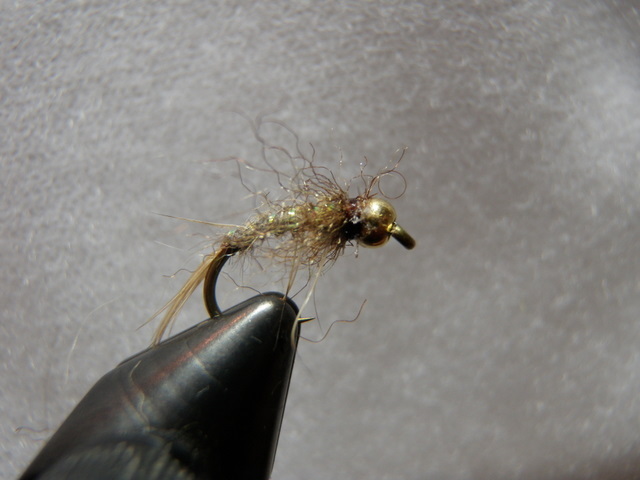 Scott Sanchez’s book presented a third ultra zug recipe, and I was so enamored with the results of the first two patterns that I replicated, that I decided to tie five ultra zug free-living caddis. 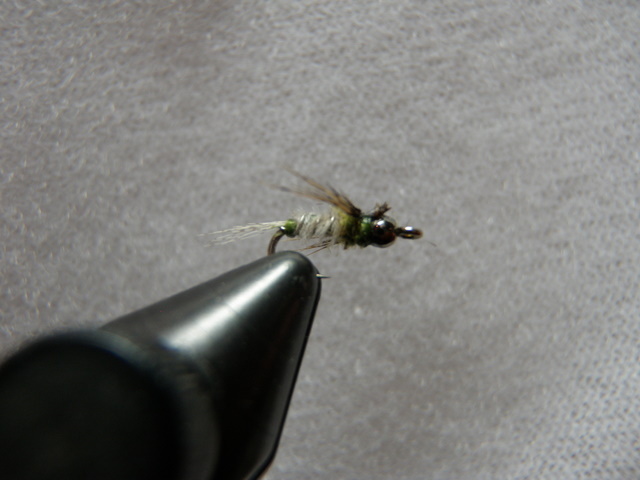 As with the others, this is a simple tie and could replace the bright green caddis pupa that take longer to make. I raided daughter Amy’s bead collection to obtain the plastic black bead for this fly. Thanks Amy. The ultra zug hare’s ear is a variation on the ultra zug. I was quite pleased with the ultra zug, and Sanchez provides the recipe for an ultra zug hare’s ear at the end of the chapter. Could this be a faster tie for the beadhead hare’s ear that I tie in large quantities? I made five of these, and I hope to test them in situations where I use the beadhead hare’s ear and compare the performance. The pattern called for synthetic hare’s ear dubbing for the abdomen, but I elected to use the scraggly hair from a hare’s mask that I normally use. I believe that the guard hairs protruding in every direction are part of the reason this fly is so effective. For the collar I tried two different materials. On the first three I used the charcoal gray sculpin wool that my friend Jeff sent me. My beadhead hare’s ear has a gray wing case and light brown or tan legs, so I felt the charcoal wool approximated this coloring near the head of the fly. The last two I tied using synthetic olive brown dubbing material. These look equally buggy with a darker coloration near the head of the imitation. 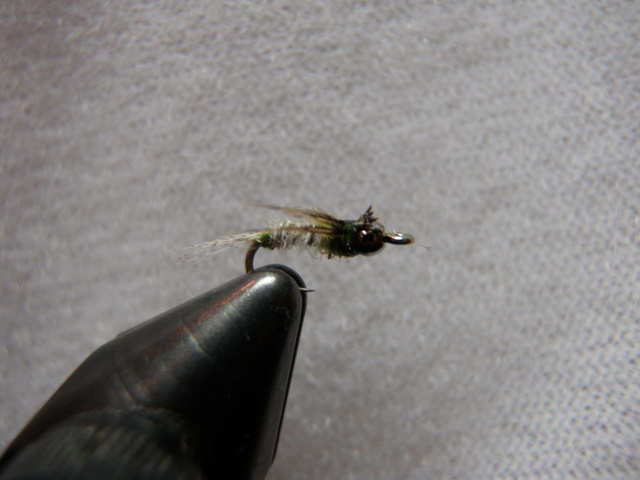 Another fly that caught my eye as I perused the Scott Sanchez book was the ultra zug so I decided to make some. I made five with beadheads, and I think these could be used in place of prince nymphs. I love the crystal flash rib and the collar of spun dubbing. They look extremely buggy and require no wing case or feather fibers for legs. I’m betting the fish will not miss the wing case and legs. I’ve had the most luck with prince nymphs during the Arkansas River caddis season of late April and early May. I believe the trout take the prince nymph for submerged egg layers, and the ultra zug could work well in this situation.